With its specific mass of 1.8 g/cm3, magnesium is lighter by approximately 30% compared to aluminum, and thus making it the lightest available metallic design material. Due to the high mass-specific solidity and rigidity characteristics, especially under bending and buckling stress, it has some weight advantages in the component of up to 60 and 25%, respectively, if compared to steel and aluminum. Alongside their small density, the main advantages of magnesium alloys are good availability and good mechanical properties. Moreover, the excellent recycling potential of magnesium alloys entails an economical energy balance using comprehensive recycling systems. In comparison to the primary winning of aluminum requiring approx. 67.5 kWh/dm3 energy, magnesium shows a favorable energy demand of 60.0 kWh/dm3. If magnesium is recycled in an alternative way, from magnesium quality class 1 scrap, the balance can be further improved. Hereby, only five percent of the energy, used for the primary winning, is required. Despite these advantages, magnesium alloys stay far behind other lightweight design materials in terms dissemination. The reasons are the unsatisfactory corrosion resistance of magnesium alloys, reservations in terms of the hazard potential, and the lack of suitable process technologies for the forming of magnesium sheets. It was not until the manufacture of “high purity” (hp) magnesium alloys with a small percentage of iron, copper, and nickel, that the corrosion resistance was considerably improved, enabling magnesium alloys to compete with aluminum materials in this respect also. Recent market analyses assume a growing European market for magnesium alloys of two-digit growth rates. Within the period of 1990 to 1998, the consumption of magnesium in the automotive industry thus grew from 23.000, to more than 90.000 t/year, with an average growth rate of 20%. Today, cars usually contain around 3 kg of magnesium. Single cars of leading European producers, however, contain 5 to 7 times more. According to a US study, some automobile producers will use as much as 100 kg of magnesium in their cars adhering to the objective to reduce the total weight of cars by 10%. This may suggest a sizable growth potential to be expected for this material considering an expected world-wide production of 55 million cars per year. The application of formed magnesium wrought alloys components, however, is restricted due to lack of knowledge for processing magnesium alloys, especially forming processes at elevated temperatures. Traditionally, forming processes are usually carried out in isothermal conditions. In other words, the processes are conducted under conditions of constant and homogeneous temperatures of tools and the work piece. 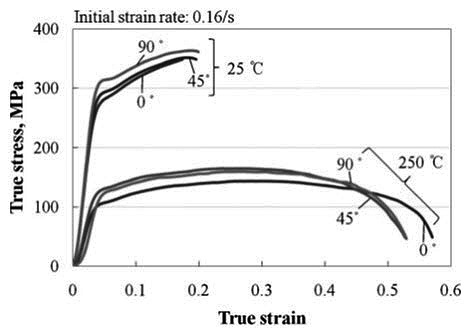 However, deep drawing tests with magnesium alloy sheets show that the drawability of sheets can be improved by local heating based on the change of material property with respect to temperatures. In the paper of Myeong Han Lee et al, the warm deep drawing processing of magnesium alloy sheets was studied using both the non-isothermal simulation and the experimental approach. In order to verify the warm forming process, tensile tests and warm circular cup deep drawing experiments were conducted. In the FE simulations, the difference between the isothermal and non-isothermal simulation results and the progress of warm forming are also discussed. At the same time, thickness distribution and major strain distribution in the sheet obtained in experiments were compared with non-isothermal FE simulation results. To determine the mechanical properties, uniaxial tensile tests on AZ31 were conducted at temperatures ranging from room temperature to 300°C. AZ31 magnesium alloy sheet specimens with a thickness of 0.8mm were prepared according to ASTM E8. Tensile specimens had a gauge length of 25mm and width of 6 mm. The specimens were elongated at nominal strain rates of 0.16/s. As shown in Figure 1, the true stress-strain behavior of the AZ31 sheet at elevated temperatures indicated increased elongation and decreased stress. 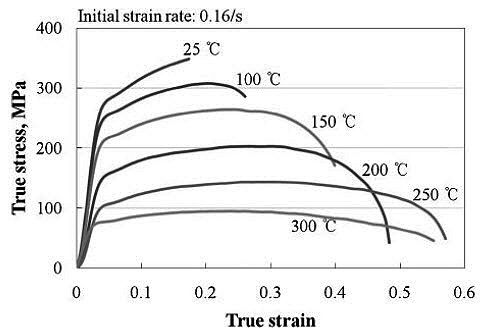 Figure 2 shows the stress strain relations of the AZ31 at 25°C and 250°C from specimens cut along 0°, 45°, and 90° angle with respect to the rolling direction. During flow stress at 250°C, the strength of the transverse direction samples was greater than the rolling direction samples, and the strain of the rolling direction samples was greatest due to the anisotropy of magnesium.